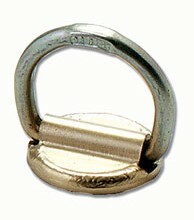 PRODUCT: Guardian #00610 Weld on steel application anchor point. Forged steel D-ring 2 1/2" diameter. Price/Each. Permanent application permissible if user applies appropriate finish.